Erected by Roderick Gunn retired police constable Caithness Constabulary in ever living remembrance of his beloved wife. Margaret Bain died at Upper Osclay Lybster 12th July 1934 aged 78. 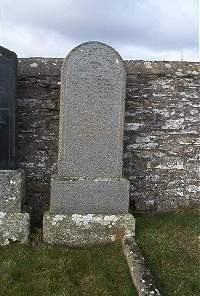 Above Roderick Gunn died at Janetstown Latheronwheel 27th February 1939 aged 78.